The Russian revolution remains the high point of working-class history. On 25 October 1917, the Second Soviet Congress unanimously voted to form a coalition government of parties represented in the soviets. The Congress created the Council of People’s Commissars (Sovnarkom) as the day-to-day government, with Lenin as chair. Apparently Trotsky proposed the name commissar, to distinguish them from bourgeois cabinet ministers. Academic histories tend to neglect the study of Soviet government institutions in favour of accounts focused on the role of the party. That is because they want to project the later degeneration of the workers’ state and the rise of the Stalinist bureaucracy back onto the original revolution. At the beginning, neither the Bolshevik party central committee nor the Politburo (formed in 1919) functioned as the government. Sovnarkom led the government and neither Lenin nor Trotsky occupied any post in the party machine (Rigby 1979). When they sprang up in early 1917, the factory committees functioned essentially as trade union organisations, fighting to achieve the eight-hour day and to improve wages (Smith 1983). Mandel’s study found that workers’ control remained “first and foremost a practical response to the concrete problems the workers faced and not, as the dominant view in western historiography has maintained, an anarchistic or anti-authoritarian movement” (1984). Under the new Soviet state, unions were the site of fractious battles between the Bolsheviks and other political forces. 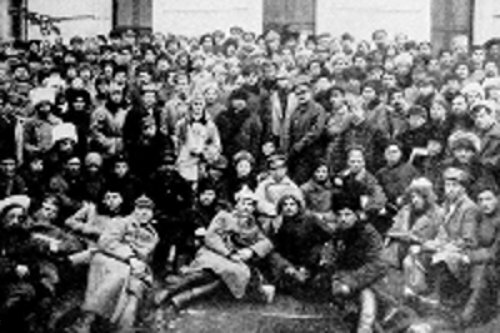 The main railway workers’ union Vikzhel, led by Mensheviks, launched the first general political crisis of the regime over the establishment of a coalition socialist government. At the end of December 1917, the minority Bolshevik fraction walked out of the union’s congress and set up a new organisation (Aves 1989). The trade unions were strengthened by the incorporation of the factory committees at the beginning of 1918. At the beginning of its rule the Bolshevik party did not have an apparatus. In February 1918, the staff of the renamed Communist Party central committee consisted of 10 people (Liebman 1975 ). The central committee secretariat’s staff grew from 30 in February 1919 to 150 in March 1920 and 602 the year up to March 1921 (Pirani 2008). In The State and Revolution (1917), Lenin wrote that the two institutions most characteristic of the bourgeois state machine were the bureaucracy and the standing army. He took from Marx that the destruction of the bureaucratic-military state machine was “the precondition for every real people’s revolution”. The bureaucracy was not born of a one-party state, or the rule of the Bolshevik party. Administration is a necessary function of any state, but precisely because of its role in allocating, dividing up and distributing the surplus product, it carries the risk of developing into a bureaucratic layer with its own distinct interests. In backward Russia, with a huge pool of peasant labour and a minority working class, such a bureaucracy composed of residue elements of the old ruling class was able to wrap its tentacles around the organs of workers’ power from the beginning.